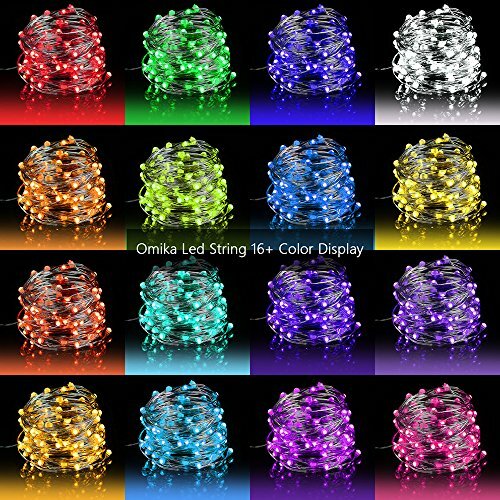 Fantastic 16 Colors: Awesome 32 ft / 100 LEDs dimmable lights with 16 individual color, perfect for Bedroom, Corridor, Patio, jars, vase. Come with a 24-key remote controller, it easily selects from 16 colors and 4 lighting patterns (Flash, Strobe, Fade and Smooth),5 brightness levels, timer mode (6 hours on and 18 hours off). IP 65 Waterproof Battery Case(3*2 inches) 3 AA battery required ( not included ), lightweight and convenient for carrying,it can meet normal use outside, For better experience, please avoid placing under water for a long time. Latest 4 Wires: Each strand consists of 4 high-quality, sturdy, waterproof and insulated silver wires, It won't get overheated even after long time use. Our Warranty: We offer 1-Year quality guarantee. Please contact us directly if you have any quality problems.